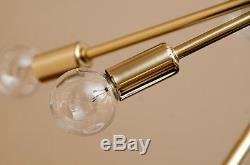 A Vintage style Mid Century Modern Brass Sputnik atomic table lamp starburst light lamp. This starburst table lamp is made with UL approved parts. It has 16 arms and measures 22 in diameter without light bulbs. It uses standard candelabra socket light bulbs. We recommend 8W to 15W max. Light bulbs are not included. We hand craft all of our lamps. This sputnik table lamp has been made with brass material. Minor variations in finish are an inherent characteristic of such material and add to the. Beauty and uniqueness of the product. 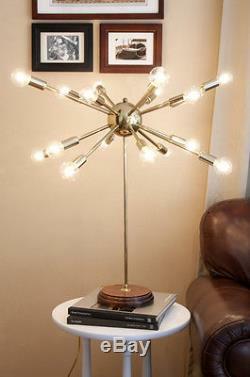 Premium quality mid-century sputnik table lamp. Made of pure brass in shiny polish finish. Measurements is : 22" x 22" x 28 total height from bottom of base to highest light bulb. 4 center ball with 16 arms. Table lamp used standard candelabra E12/E14 light bulbs. Brass in shiny polish finish. (Other finish options are available like matt brass, chrome nickel and antique patina brass). All Components are UL approved. Requires one (16) 15 watt bulb type A (not included) - E12 socket rated with 125 voltage, 75 watt max. E14 socket rated with 250 voltage, 120 watt max. 7 watt to 15 watt bulbs are recommended. Incandescent Bulbs, Energy Saying, LED Bulbs. 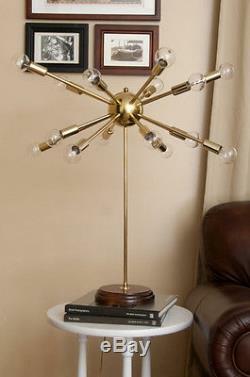 The item "Mid Century Sputnik style table light lamp with 16 bulbs. Sputnik Table Lamp" is in sale since Thursday, July 30, 2015. This item is in the category "Collectibles\Lamps, Lighting\Lamps\ Electric\Table Lamps". The seller is "nauticalvintage" and is located in DELHI, DELHI. This item can be shipped worldwide.